The control room for Vice Canada's 24-hour channel Viceland is seen in this 2015 file photo. On Monday, Rogers Media formally cut ties with Vice Canada. Rogers Media Inc. has declared an early end to its deal with Vice Media Canada Inc., stopping its support of a joint venture between the two that included the Viceland television station and a Canadian content production studio. Rogers said Monday it has transferred its interest in the studio to Vice Canada and that Viceland will stop broadcasting on March 31. The TV station has been on the air for less than two years and sources have said it loses money and struggled with low ratings. 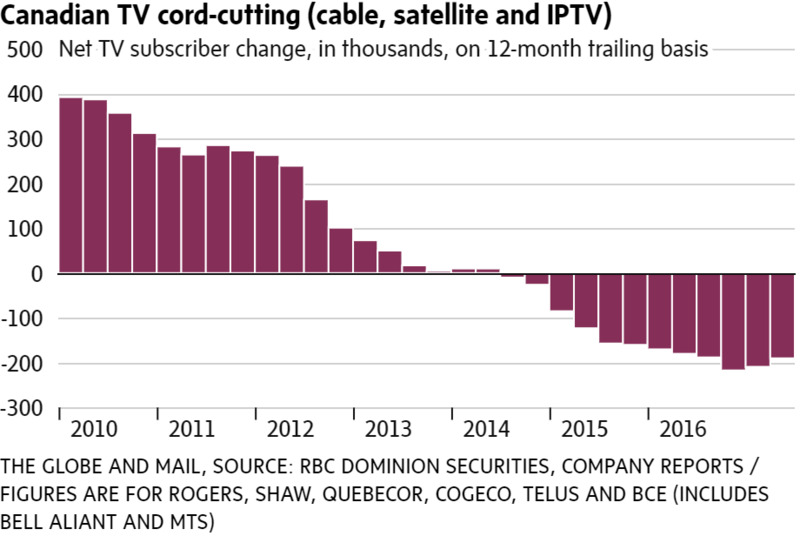 It also struggled to grow its subscriber base: the channel was carried by all major cable and satellite companies in Canada, but failed to reach its projections for six million subscribers by this year. The Globe and Mail reported in November that Rogers (which is owned by telecom company Rogers Communications Inc.) had informed Vice Canada it no longer planned to financially support the station. Monday's announcement also puts an end to the broader partnership between Rogers and Vice, which former Rogers CEO Guy Laurence struck with Vice co-founder Shane Smith in 2014. The deal included a $100-million investment – with $50-million contributed by each company – to build the studio and production facilities, pay for staff, and cover operating costs for the Viceland channel. Rogers subsequently spent an additional $50-million on creation of Canadian content through the studio, bringing Rogers's total investment in the Vice partnership to $100-million. Vice would not comment on how much it had spent so far. The intended three-year term for joint investment in content production began in early 2016, and would have wrapped up by the end of this year; it has now ended early. The entire joint venture ended on Jan. 1, 2018, and on that date, Rogers transferred library rights to the 130 hours of content already produced into Vice's full ownership. Vice's Canadian operation currently employs roughly 200 people, a mix of part-time and full-time staff that expands and contracts depending on the volume of productions, Vice spokesperson Chris Ball said. The deal's end will mean some job cuts, he said, though the company would not say how many. Last May, employees at Vice Canada ratified a collective agreement with management, after joining the Canadian Media Guild the previous year. At the time, the agreement covered roughly 170 staff. The Guild released a statement on Monday reminding members that they have rights to severance pay, and to recall if an equivalent job opens up again at Vice within a year. "This business decision means that dedicated and talented people will lose work," the Guild said in a statement. Mr. Ball said that Vice hopes to strike new content deals that will mean it can hire back any staff who are affected by the cuts. "It doesn't mean that Viceland is going away," Mr. Ball said. Mr. Laurence championed the partnership with Vice Media but when Rogers fired him as CEO in October, 2016, many of his favoured projects came under renewed scrutiny. Rogers Media said in a statement it is "evolving its strategy" to meet changing audience demands. "We plan to redirect our Canadian content funding to other Canadian content initiatives that better align with our portfolio and brands. Content ownership remains a core part of our strategy and we will be actively exploring new content opportunities that appeal to a broad audience." Companies in the TV sector have been re-evaluating how to compete for viewers, as digital streaming services have arisen to disrupt how business is done, and how people consume content. The number of households paying for TV subscriptions – whether cable, satellite or IPTV – has been declining since mid-2014. Meanwhile, while most video from subscription services is still viewed through a TV package, the number of hours people spend viewing video through digital subscription services such as Netflix, is steadily growing. "The ability to distribute digital content at near zero marginal cost lowers barriers to entry and devalues inefficient, ineffective, and/or over-priced content bundles," RBC analyst Drew McReynolds wrote in a research note Monday. The note was unrelated to the Rogers-Vice deal but provided an overview of the Canadian media industry. "… Content unbundling is revenue eroding, as evidenced by the decline in music industry revenues, and as what will be evidenced by a decline in television industry revenues." For its part, Vice Canada said it will announce "new partnerships in the Canadian market soon" and added that the "core pillars" of its business remain: its Canadian studio, its digital operations and Virtue, a global creative agency that develops content for brands. "Rogers Media's initial investment helped to establish our studio as a leading producer of some of the most engaging Canadian content out there and we thank them for their partnership," Ryan Archibald, president of Vice Canada, said in a statement. In June, 2016, Rogers said it was adding six new shows to the Canadian channel, including the network's first scripted series, Nirvanna The Band The Show. Viceland has also run critically acclaimed content such as Ellen Page's Gaycation. Regaining ownership of its content library means that Vice could strike deals to bring that content to digital streaming services that are looking to build up their libraries, such as Netflix Inc. Rogers rival BCE Inc. also has its own streaming service, CraveTV. Last year, Vice announced a deal with Bell Media to broadcast Vice News Tonight and also said it would work with Bell's CTV investigative news program W5 to produce two documentaries on the opioid crisis. Viceland content will still be available on Vice.com. Viceland operates under a licence for a discretionary television service and the Canadian Radio-television and Telecommunications Commission (CRTC) renewed its licence for five years in September. Vice owned a 30-per-cent stake in the channel; on March 31, that interest will be transferred to Rogers, which owns that TV licence, and the channel will stop broadcasting. Viceland had shed some subscribers following the channel's conversion from its former life as The Biography Channel: In 2016, its subscriber numbers slipped to 1.5-million, a 7.5-per-cent decline compared to the previous year. Subscriber revenues declined nearly 19 per cent, to 4.68-million. (Those numbers, reported to the CRTC, are not a perfect measure of Vice's performance, however: They reflect the first six months of the channel's performance, as well as the previous six months under its prior branding.) At the same time, perhaps reflecting advertisers' appetite to reach the kind of younger viewers that Vice caters to, advertising revenues showed early signs of improvement, though from a very modest base: the channel's 2016 ad revenues were up 30 per cent, to $786,766. Editor’s note: An earlier version of this story said Rogers cable was the only service that carried Viceland. Why aren’t people watching Nirvanna the Band the Show?